1. IS Robotics offers a super-realistic interactive life-sized human baby toy. 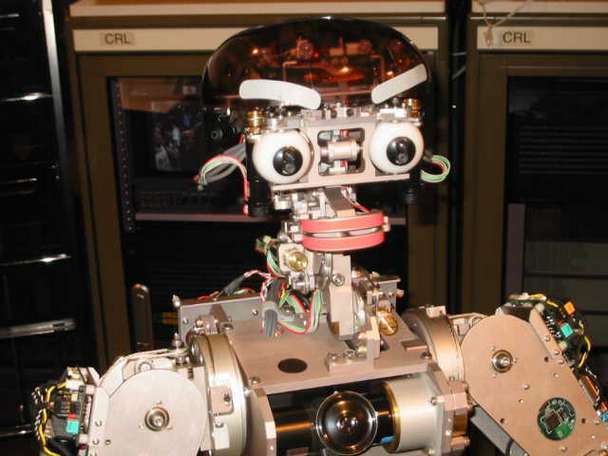 IS Robotics was founded in 1990 by Rodney Brooks and Colin Angle of MIT. Last year they hooked up with Hasbro Toys to have them produce the baby-bot. It can be operated with a RC joy-stick control system. It has up to 60 servos and many movements. 14KB 1. 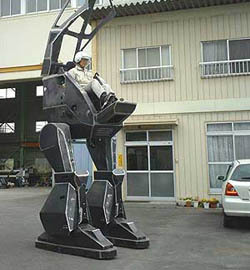 A Japanese company called Sakakibarar Kikai (located in the Gunma prefecture about 100 miles NW of Tokyo on the island of Honshu) has built a Mecha which they call Land Walker. 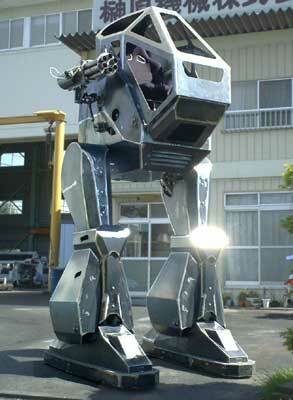 This Mecha is right out of Star Wars or Robocop. It is equipped with gatling guns which shoot 4" diameter foam balls. It is 3.4 meters tall, 1.65 meters wide, and 2.4 meters long. It weighs one metric ton and is powered by a 250 cc engine. It can walk at 1.5 Km/hr (nearly 1 mile/hr). FABULOUS! They have videos of it walking and shooting. Get yours now! 2. Hiroaki Kitano of Kitano Symbiotic Systems (Tokyo, Japan) which is a subsidiary of Japan Science and Technology Corp (see entries 9-11 of the World's greatest android projects) which is in turn funded by the Japanese government is building an android baby called Pino. Pino has 29 motors and stands about 75 cm tall and weighs 8 kg. Main Pino site is here. Here is the design. Pino 2. Colin Mayhew has built a MONSTER Mecha which he calls the Mini Cooper R50 or the R50R for short. 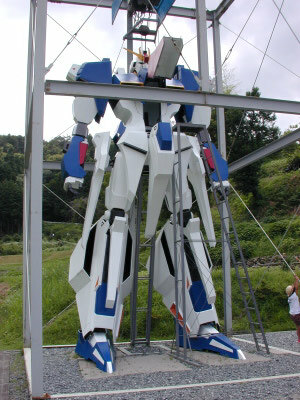 His Mecha stands about 14 feet tall and about 12 feet wide. It is powered by 4 1.6 liter automobile engines. 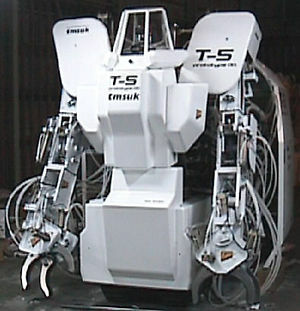 It is controlled by 6 PCs running RT Linux and its balance is monitored by 6 gyros. Colin has several videos on his site. 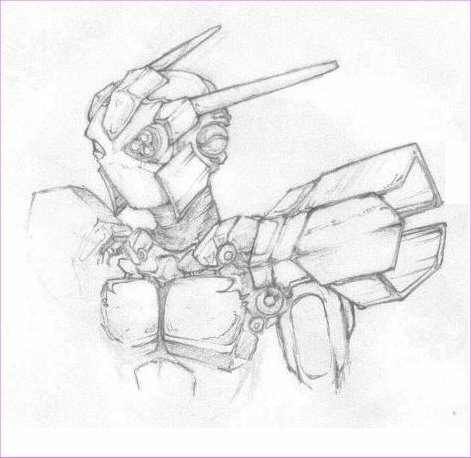 Several readers have written to say that this Mecha is a FAKE. Too bad, but its a pretty good fake. Here is a link to a story about the faking. 3. Dr. Aude Billard formerly of USC has a project to build baby androids. She calls them Robota dolls. These are dolls which have been taken apart and 5 motors are inserted in place of the torso to move the legs, arms, and head (5 DOF). Prof. Billard is now at Ecole Polytechnique Federale de Lausanne (Switzerland) where she is a member of their humanoids project. 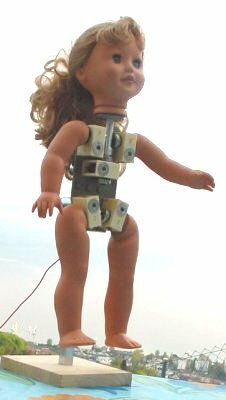 Robota Dolls 3. 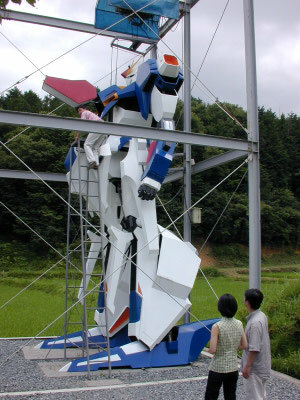 A group in Okayama Japan has built a giant Gundam. It is 7 m (23 ft) tall, 3.5 m (11.5 ft) wide and weighs 2 tons. Here is another set of photos. And here is the report. You can find some more pix here. 4. Here is a baby project in Italy. The LIRA-Lab is building a baby humanoid. 5. Anybody remember the Small Wonder TV series which ran from 1985-1989? It starred Tiffany Brissette as Vicki the android girl. 5. 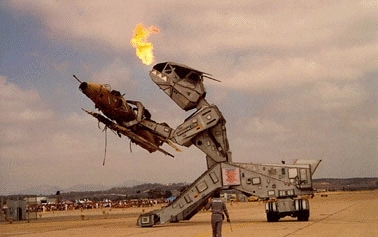 Mechanized Propulsion Systems is building a 25 foot tall Mecha. 6. 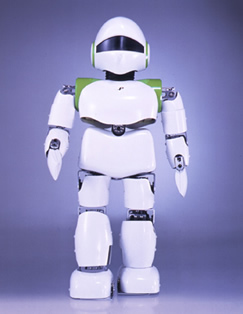 The Keihanna Human Info Communications Research Center is building a baby robot which they call the Infanoid. Hideki Kozima is working on the project at the Communications Research Laboratory. The Infanoid was shown at the recent Osaka Robot Festival where Eric Schreiber took some nice pictures of it. Infanoid 6. 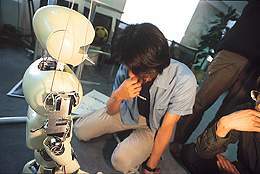 Joe Cronin is leading a project at the University of New South Wales in Sydney to build a humanoid robot called Robolift. It will be 3 meters tall and be capable of lifting 1100 pounds (500 kg). Another nearly identical report. 8. 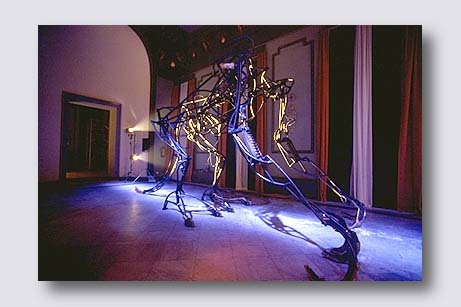 The Amorphic Robot Works in San Francisco, California (USA) consists of a group of artists who build "Amorphic Robots". They tour the world with 60 interactive and computer-controlled human and abstract machines ranging from 12 inches to 30 feet in size. 9. 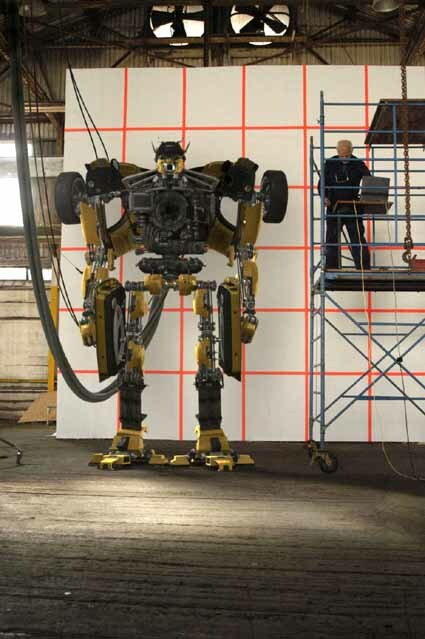 Carlos Owens of Alaska, USA is building a 11m (35 foot) tall Mecha which he calls the NMX03-1. It will look anthropomorphic with two arms and two legs. Good luck Carlos!